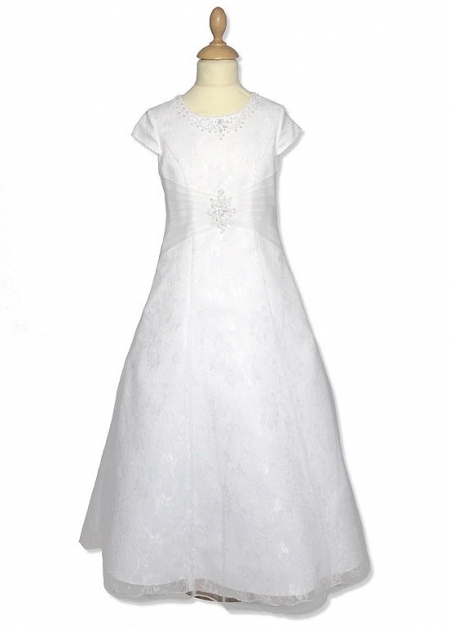 Marvellous "A" line shape First Holy Communion white dress Short sleeves. Full length dress with beading at the neckline and waist. Zipped at rear with buttons effect. Fully lined. New for First Holy Communio. Made by Linzi Jay as part of their Little White Collection. Style number LWCD2. This item is in stock in our shop for viewing/trying. You are welcome to our shop if you live nearby. We are a real shop on the high street in Ashford Middlesex, not just Internet only. 7x Yrs 27.5" 25.5" 42"